L'Informale: What is the political relevance according to you of Donald Trump's decision to declare Jerusalem the capital of Israel and to relocate the American embassy from Tel Aviv to Jerusalem? Daniel Pipes: The embassy move strengthens the U.S.-Israel tie which in turn makes Palestinians and others more likely to end their hostilities against the Jewish state. L'Informale: The decision happens in a new Middle East scenario where the main Sunni states, specifically Saudi Arabia, are converging toward Israel in the name of the common threat represented by Iran. Would you like to comment on this? Daniel Pipes: Part of the incentive for a Palestinian-Israeli deal is to ease the way for Saudi-Israeli cooperation against Iran. L'Informale: There is a wide perception that the Arab-Israeli conflict or Palestinian-Israeli conflict is no more on the top shelves for the Arab world, especially for Saudi Arabia. The latest rumors are that prince Mohamed bin Salman, the most probable new king of the country has told Palestinian Authority president, Mahmoud Abbas, that it would be better for him to endorse the new American peace plan of which we still don't know the details. What is your opinion? Daniel Pipes: Yes, Mohammad bin Salman seems eager to improve relations with Israel; this is the silver lining of Obama's horrible Iran deal. These are impeded by the Palestinians, so he is pushing for a deal. 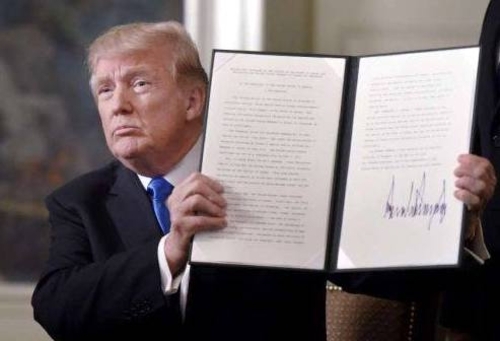 Trump holding the order moving the U.S. embassy to Jerusalem.